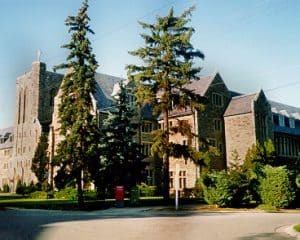 ​The history of Loretto Abbey lies deep in the history of Toronto. The Abbey, a school for girls, was established by the religious of the Institute of the Blessed Virgin Mary, better known as the Loretto Sisters. The Institute, which has a long tradition in education, was founded for that purpose early in the 17th century by an English woman, Mary Ward. Mary Ward has been described by Pope Pius XII as “that incomparable woman given to the Church by England in its most somber and bloodstained hours”. On September 16, 1847, there came from Loretto Abbey, Rathfarmham, Ireland, at the invitation of the first Bishop of Toronto, the Most Reverend Michael Power, five young missionary sisters, all in their 20s, who would be the first religious teachers in the newly formed diocese. A house was secured for the community on the north side of Duke Street and a school was opened on September 29th. The school was planned on the model the sisters had known and Bishop Power had admired at Loretto Abbey, Rathfarmham. The school was moved in 1853 to a three-story frame building between King and Adelaide Streets on Bathurst Street. Later the school was moved to a new building on Bond Street. By 1860 the number of pupils who had attended Loretto House was more than 1,500. In February 1867 the Loretto Sisters purchased Lyndhurst, an interesting property on Wellington Street West. The house had been built around 1835 by the Attorney-General Robert Jameson, for his English bride. After Mrs. Jameson returned to England, the house was sold to Frederick Widder of the Canada Company, who named it Lyndhurst, and who entertained many distinguished guests in it including in 1860, the Prince of Wales, later Edward VII. The house was enlarged to meet the needs of the school and the name Loretto Abbey was given as in Ireland. For many years the Abbey was a private grammar and finishing school following a pattern distinctive to the Loretto tradition. Toronto was growing rapidly. The once beautiful residential district bordering the lake in the vicinity of Wellington Place, was fast becoming industrialized and quite unsuitable for a girls’ school. Property was acquired in North York just beyond the city limits. On Sunday, May 22, 1927, the cornerstone was laid and in September 1928, the impressive Tudor Gothic building of cut stone, the new Abbey, opened its doors to more than 100 boarders and as many day students. In 1986, Loretto Abbey High School became a member of the Metropolitan Separate School Board (now Toronto Catholic District School Board) family of schools. Extracted from the History and Tradition of Loretto Abbey.